Add a little romance to the table with these bite-size Gluten-Free Vegan Chocolate Strawberry Truffles. 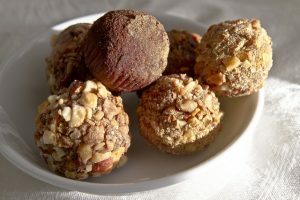 The walnuts in this luscious truffles recipe may help reduce not only the risk of prostate cancer, but breast cancer, too. Walnuts contain several unique and powerful antioxidants and phytosterols available in only a few commonly eaten foods. Dates are rich in dietary fiber, antioxidants and the essential minerals potassium and magnesium. Don’t feel guilty about this choice of sweets. A diet that regularly includes nutrient-dense foods like dates may help decrease your risk of developing many chronic diseases. The stars of this recipe, strawberries contain powerful antioxidants that work against free radicals, inhibiting tumor growth and decreasing inflammation in the body. When these beneficial ingredients come together they form a delicious cancer-fighting dessert. 1. Blend walnuts in food processor. 2. Add in dates and strawberries. 3. Add cacao and continue to blend until all mixed well. 4. Remove mixture to a bowl and place in the freezer for about 30 minutes to firm up. 5. Remove from freezer and roll into truffle-sized balls. Roll in your topping of choice.